A balanced power system. Introduction to a balanced set of phasors. 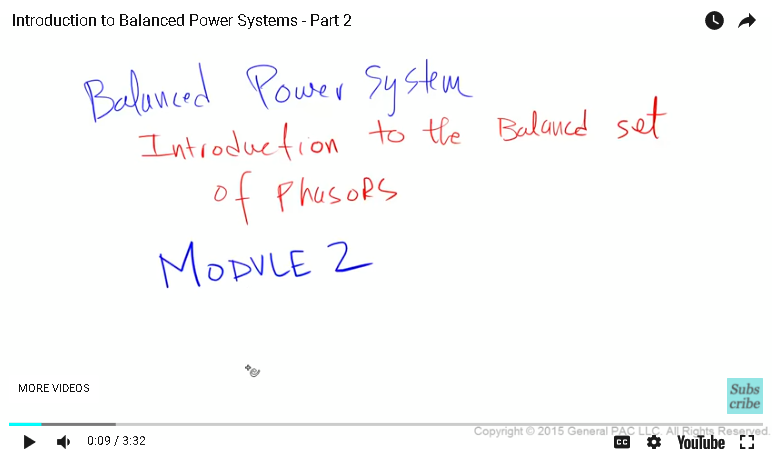 Module 2: Introduction to a balanced set of phasors – continued. In the last module, we drew the following balanced set of phasors. 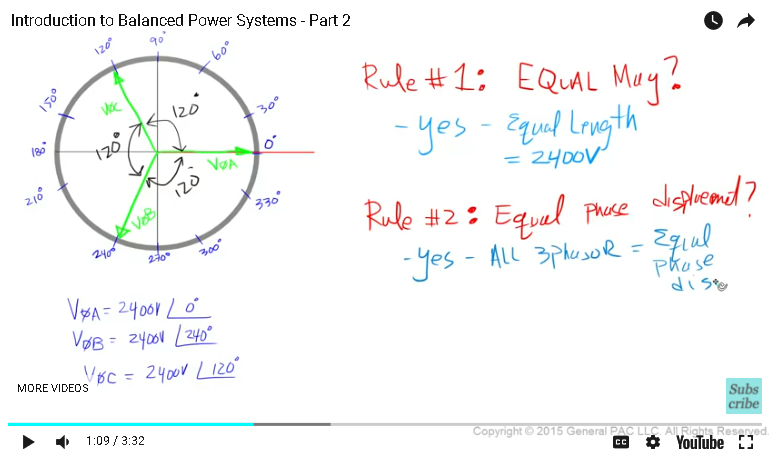 In this module, let’s make sure that we are following all 3 rules for a balanced system. 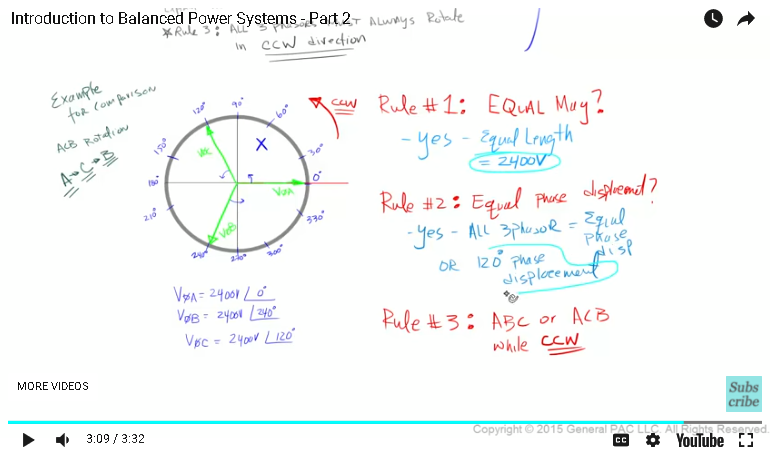 So, rule no 1: Do phase A, B and C voltages have equal magnitudes? 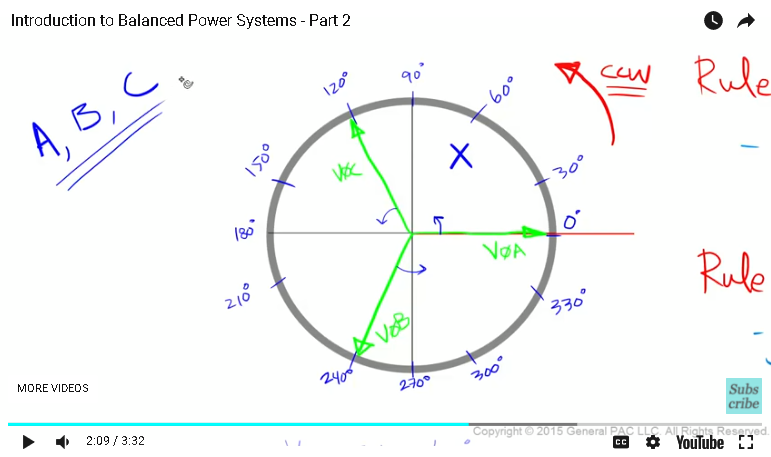 Yes, all 3 phasors have equal length which represents 2400 volts, so they all have equal magnitudes. Rule no 2: Do we have equal phase displacements between phase A, B and C voltages? Let’s see, there is 120° degrees phase displacement between phase A and phase C voltage and 120° degrees phase displacement between phase C and phase B voltage, and 120° degrees phase displacement between phase B and phase A voltage. So yes, we follow rule no 2. All 3 phasors have equal phase displacements or in other words, all 3 phasors have a 120° degrees phase displacement between them. Rule no 3: Do phase A, B and C voltages have an ABC or ACB phase rotation or phase sequence while rotating in a counter clockwise direction? Well let’s see, first we have to assume that the set of phasors are all rotating in a counter clockwise direction, so we will assume that all 3 phasors are all rotating counter clockwise. Let’s put a stationary mark here, now as the phasors rotate counter clockwise, the first phasor to cross the stationary mark is phase A voltage, the second phasor is phase B voltage and the third phasor is phase C voltage. Since three phasors cross the stationary mark in an ABC order. This set is represented as in ABC phase rotation or ABC phase sequence. Just to give you an example of a comparison. For an ACB phase sequence or ACB phase rotation, we would expect phase A voltage cross the stationary mark first, then phase C voltage to cross the stationary mark second and lastly phase B voltage to cross the stationary mark third and that would be represented as ACB phase rotation or phase sequence. And that my friends is what we call a balanced set of phasors. The magnitude of all 3 phasors is 2400 volts. All 3 phasors are equally displaced by 120° degrees and as all 3 phasors rotate in a counter clockwise direction. They have an ABC phase sequence or phase rotation. In the next module, we are going to look at the different examples of a balanced set. Thank you..This module was brought to you by GeneralPAC.com.